Parkinson's disease (PD) is a degenerative disorder of the central nervous system. This debilitating condition mainly affects the motor system. This is the part of the central nervous system that's involved with physical movements. Regular acupuncture has shown improvements in symptoms with people suffering Parkinson’s disease. 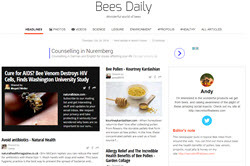 More interesting is that bee-venom acupuncture has been showing some promising results too. The way it works is by injecting bee venom under the skin, right at the acupuncture point. The idea is that this may help to increase and extend the effects of stimulus of these acupuncture points. The overall mechanisms of bee-venom acupuncture seem to be like those of conventional acupuncture. There could also be another effect due to the bee venom itself. The results are not yet conclusive, though trials and treatments continue in this area. One theory is that the bee venom may act like the toxin in Botox. This botulinum toxin causes a temporary paralysis of the muscles. Some of the Parkinson’s symptoms include muscle spasms. These are what can cause great pain for Parkinson's sufferers, and trouble with movement. Bee venom may help relax these muscles. The following trial was presented by Seong-Uk Park, MD. A small study of just 35 patients with Parkinson's disease was involved in the trial. All the volunteers had been on a stable dose of medication for at least one month. They were then randomly assigned to three groups. One of the groups received regular acupuncture. Another of the groups received bee-venom acupuncture. And the third group received neither. The treatment went on for eight weeks and repeated twice a week for the duration of the trial. Symptoms improved in the patients who received either bee-venom acupuncture or regular acupuncture. Neither group reported any serious side effects. As expected, there was no change in the symptoms of the group who received no acupuncture treatment. You can read more on this research study here: Bee Venom Acupuncture Shows Promise in Parkinson's. So far the results for bee venom acupuncture are promising. Even so, more research needs doing before science can draw any firm conclusions in this area. Standard acupuncture is quite a common treatment for Parkinson's disease. Despite this, it still lacks hard, scientific evidence of its benefits. Organic Bee Pollen is great on it’s own, taken with water, or sprinkled on cereal or in a smoothie. There are some great organic bee pollens on Amazon.